An all-star cast drives to the hoop in the hilarious basketball comedy Uncle Drew, arriving on Digital September 11 and on 4K Ultra HD™ Combo Pack (plus Blu-ray and Digital), Blu-ray™ Combo Pack (plus DVD and Digital), DVD, and On Demand September 25 from Summit Entertainment, a Lionsgate company. 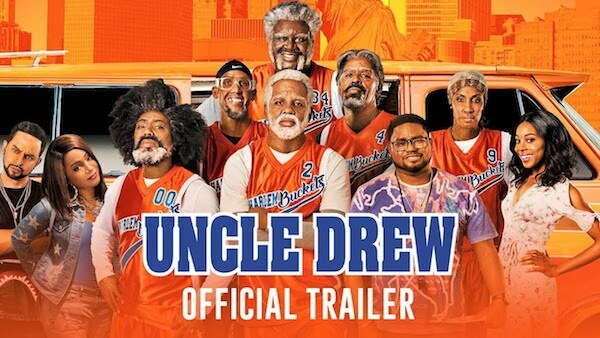 Based on the hit Pepsi web series, the film tells the raucous tale of a young team owner and Uncle Drew rounding up Drew’s old basketball squad to prove that a group of septuagenarians can still win the big one. Starring in the film are NBA All-Star Kyrie Irving (Uncle Drew Web Series); Lil Rel Howery (Get Out, TV’s “Friends of The People” and “The Carmichael Show”); four-time NBA champion and Basketball Hall of FamerShaquille O’Neal (The LEGO Movie, Scary Movie 4); five-time NBA All-Star Chris Webber (Unexpected, Like Mike); five-time NBA All-Star, Basketball Hall of Famer and Olympic Gold medalist Reggie Miller (He Got Game, Forget Paris); three-time NBA slam-dunk champion Nate Robinson (TV’s “Mike & Mike” and “Ridiculousness”); NAACP Award-winner Erica Ash (Scary Movie 5, You Can’t Fight Christmas, TV’s “Survivor’s Remorse”); two-time WNBA champion, three-time WNBA MVP, four-time Olympic Gold Medal winner and Basketball Hall of Famer Lisa Leslie (Think Like a Man, Martin, Inconceivable); withTiffany Haddish (Girls Trip, Keanu, TV’s “The Carmichael Show”), and Nick Kroll (Sausage Party, Sing, TV’s “The League”). After Dax (Lil Rel Howery) loses his street ball team to his archrival (Nick Kroll), he’s desperate for a way to enter the upcoming tournament and win the cash prize. Dax stumbles upon the man, the myth, the legend Uncle Drew (NBA All-Star Kyrie Irving), and draws up a crazy game plan: convince Drew and his old squad (Shaquille O’Neal, Chris Webber, Reggie Miller, Nate Robinson, and Lisa Leslie) to hit the court one more time and prove that septuagenarians can still win the big one! The Uncle Drew home entertainment release includes special features including 7 deleted scenes, 3 behind-the-scenes featurettes, an animated short, and an audio commentary with director Charles Stone III. Both the 4K Ultra HD Combo Pack and the standard Blu-ray disc will feature Dolby Atmos audio remixed specifically for the home, to place and move audio anywhere in the room, including overhead. Uncle Drew will be available on 4K Ultra HD Combo Pack, Blu-ray Combo Pack, and DVD for the suggested retail price of $42.99, $39.99, and $29.95, respectively. Print article This entry was posted by Art Eddy III on August 9, 2018 at 9:46 am, and is filed under Entertainment. Follow any responses to this post through RSS 2.0. Both comments and pings are currently closed.